Standard deviation assumes a bell curve of expected returns. 1. Why Do Stock Market Returns Look Like a Bell Shaped Curve? 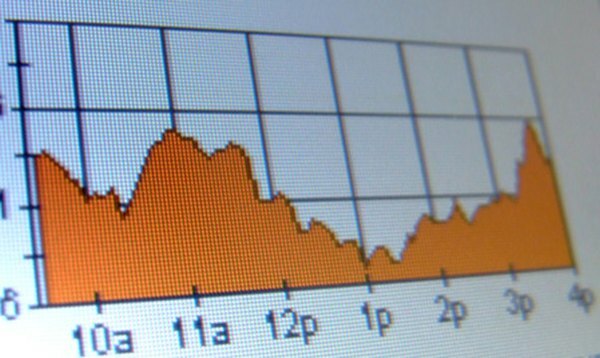 Some professional stock traders use quantitative analysis to analyze the market and predict the future value of securities. They begin by assuming that the path of a stock will be a "random walk" and that the values will be distributed along a bell curve or a normal set of values. With this data, they can use standard deviation and probability theory to make investment decisions. Standard deviation is a measure that describes the probability of an event under a normal distribution. Stock returns tend to fall into a normal (Gaussian) distribution, making them easy to analyze. One standard deviation accounts for 68 percent of all returns, two standard deviations make up 95 percent of all returns, and three standard deviations cover more than 99 percent of all returns. When a trader can assume with a 95 percent probability where the stock value will be, he has many more options for hedging and investing. Traders begin by taking the set of returns for a particular stock. They take the average volatility of the stock on a daily basis a set period, such as five years. They are likely to find that the returns form a bell curve, with returns falling equally on both sides of the curve in standard deviations. With this information, traders can create Bollinger bands that map out when a stock has moved one or two standard deviations above its normal return. When that happens, the trader simply bets that it will return to the normal return, by buying or selling accordingly. One problem with standard deviation analysis is that you do not know the value of the returns in the very low probability areas on both sides of the curve. These so-called "tails" can be quite extreme. Although you might have only a 5 percent chance of a "tail" return, the value of that tail return could be negative 10 percent in one day. However, you simply cannot quantify the magnitude of the returns you will get in the distant tails. Traders can use probability and standard deviation when calculating option values as well. They can use the famous Black-Scholes equation, which assumes that the underlying stock returns are normally distributed with standard deviations. If they can obtain the implied volatility, they can then create a risk-free position by going long on the underlying stock and short with the option, or vice versa, depending on where the stock and the option are priced. How Do I Get a Stock Beta Value? What Does It Mean if a Stock Price Goes Up or Down With Little Volume?